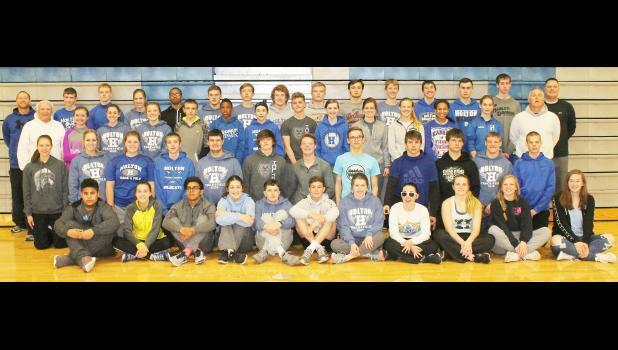 Holton High School’s 2018 track team includes (front row, left to right) Issac Mulenga, Reagan Call, Edwardo Rodriquez, Kaitlyn Peven, Riley Althauser, Cameron Smith, Ashlyn Carlson, Taylor Stevens, Shay Tanking, Cailin Parks, Kalinn Baumgartner, (second row, left to right) Madi Luck, Reagan Baum, Carly Raney, Dagan Ruckman, Andrew Harrison, Addison Hundley, Cutter White, Conor Gilliland, Jayger Carson, Jordan Huntington, Ian Watkins, Trevor Bowser, (third row, left to right) assistant coach L.D. Fletcher, Bailee Stotts, Tabor Barta, Isabell Watkins, Issiah Jenson, Marquez Conley, Hannah Ent, Mar­cus Pruett, Faith Haussler, Olivia Yingst, Page Paxton, Olivia Mulenga, Sarah Grafton, head coach Mark Middlemist, (back row, left to right) assistant coach Ryan Noel, Zach Binkley, Mason Strader, Mariah Ramirez, Runnell Grudeau, Damon Ruckman, Kale Purcell,Trey Wright, Killian O’Connor, Wyatt Marriott, Jack Gilliland, Mason Chanay, Johnnie Smith, Wyatt Nightingale and assistant coach Matt Hundley. Not pictured: assistant coach Brooks Barta, Danika Hickman, Reece Robinson, Ashlyn Robinson, Abbigail Hundley, Taygen Altenburg, Saydee Tanking, Sadie Gilliland, Cassidy Fisher, Canon Karn, Abby Boeck­man, Tressa Henry, Keegan Purcell, Lily Twombly and Kaitlyn Ramirez.